What started in the Dark Ages with a club and pine cone had developed by Elizabeth I’s reign into a team game vaguely akin to the one played today. Since then things have moved on, from the first recorded century in 1769 to the flashing stumps of 2014. A complex game of honour and skulduggery, international cricket has 3 formats: the 5-day Test match, the 1-day international, and the shorter Twenty20. 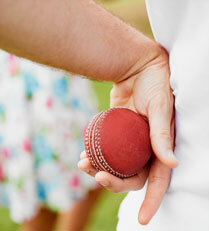 The first Test took place between Australia and England in March 1877. Australia won, rubbed English noses in it, and the oldest rivalry in cricket was born. Over the course of the next 123 years, 8 more joined the international party – South Africa, the West Indies, New Zealand, India, Pakistan, Sri Lanka, Zimbabwe and Bangladesh. 1. Women and girls play too. England’s women’s team spent the winter winning The Ashes, unlike their male counterparts. 2. It’s normal to watch cricket on TV with the sound off and listen to BBC radio’s Test Match Special (TMS) at the same time. On TMS, they talk cricket, but also life and cake. 3. The Spirit of Cricket is the belief that cricket should be played in The Right Way. Players don’t always follow it, but they get stick if they fall short. Hence the phrase: it’s just not cricket. 4. You don’t have to watch every ball. It is quite acceptable to read the paper, sunbathe and glance at the action only when it sounds worth your while. 5. The Barmy Army are England fans who follow the team all over the world. They tend to chant loudly and bake in the sun. Players love them, quieter spectators less so. 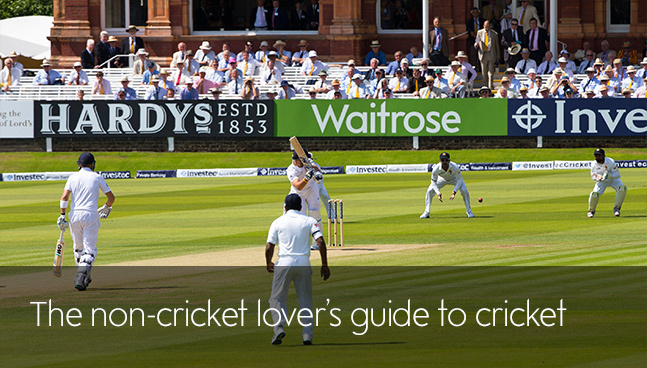 Cricket, more than any other game, is dominated and civilised by food. 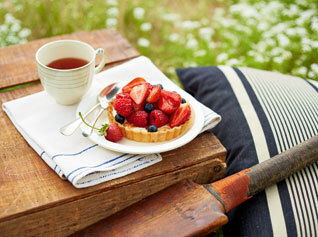 A Test match stops for lunch and then again for tea, plus most expect a liquid refreshment at the end of the day too. For 120 years or so, an international cricketer would dine on shepherd’s pie and treacle tart before popping out for an afternoon’s graft on the field. Sadly those roly-poly days are gone – now the pros eat quinoa and grilled fish. Village cricketers, however, still enjoy their mid-innings scone and jam, while for spectators, the picnic, and the conversation that goes with it, is almost as important as the match itself. Over: The set of 6 balls bowled by one person. 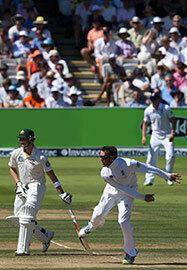 LBW: Leg Before Wicket – a way of being out by stopping the ball hitting the stumps with your leg. Sledging: Having a go at your opponent in order to distract him. Known by Australians as mental disintegration. Maiden: An over that doesn’t concede any runs. Wicket-keeper: The person crouched behind the stumps in pads and occasionally a helmet. Like a backstop. Cricket’s most famous beard was a notorious cheat but an incredible player. He put the game on the map. Simply the best. Defined Australia, defied the English and retired with a brain-scrambling Test batting average of 99.94. The personification of swagger and the most destructive batsman in the best West Indian side of all time. Still beautiful at 62. Famous for his on-field genius and off-field scandals, Shane Warne is Australia’s greatest leg-spinner and is widely regarded as one of the greatest bowlers in the history of the game. A private man who became India’s public obsession. First picked by his country at 16, he finally hung up his bat last November aged 40. Cue mass hysteria.